Microsoft Windows CE is embedded operating system designed specifically for range of applications especially handheld computing devices, automobiles and industrial equipments. Handheld PC: handheld devices supporting a display, touch screen with a small keyboard, LAN, sound, USB, and a Compact Flash and/or a PCMCIA slot. PC palm: sized devices supporting a display, no keyboard or mouse, USB, optional WIFI, sound, and a Compact Flash slot. Auto PC: in car system supporting voice activation, wireless communications, and a built-in navigation system. All of these interfaces run a shell that is very similar to the standard Windows shell. This consists of the same windowing look-and-feel along with a taskbar at the bottom that can be used to launch and control applications. 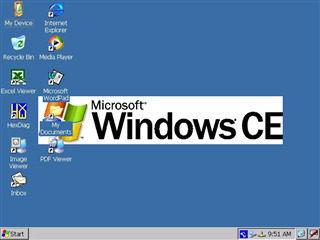 The Windows CE API provides access to a system object database. This database supports data compression, searching, and sorts and synchronization with the desktop through the Microsoft ActiveSync services. ActiveSync supports synchronization with other Microsoft products such as Outlook (for email and contacts) and Access (for database information). 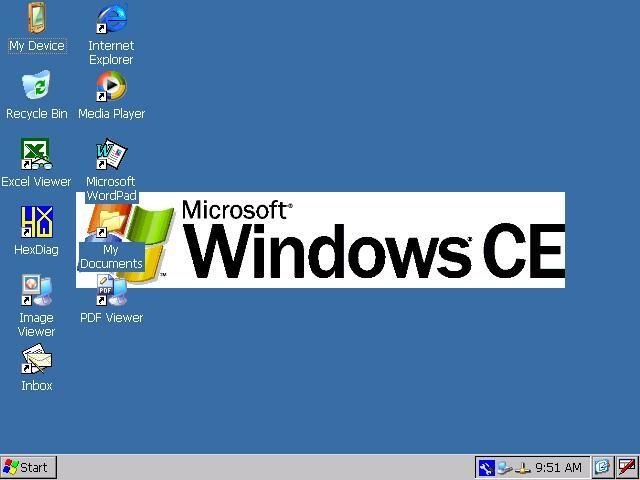 Windows CE devices support standard Ethernet connections as well as wireless LAN connections. Some devices also include a PCMCIA/SD CARD slot which obviously opens up your CE device to a very wide range of add-ons including network, GPS, and modem cards. Stereo sound is supported on Windows CE but the majority of standard Win32 APIs are not. The Windows CE API does support sound recording and playback using the Windows media player.